In honour of the three international judges who came to SA for the Old Mutual Trophy Wine Show, Chef Caro decided to pick two dishes from each country to help showcase some of the winning wines! All these wines won trophies at the show – you can find them all at Caroline’s Fine Wine Cellar or other good independent wine retailers. Debra Meiburg MW is convinced that the way for SA to crack the Asian markets is to think of our wines with food. The Buitenverwachting Hussey’s Vlei Sauvignon Blanc 2010 is a good example of a food-friendly wine although it will probably need another couple of years to reach its best. Full of spicy aromatics with glamorous hints of lemongrass and star anise, this could be a Sauvignon to beat the Kiwis at their own game! Chef Caro has gone for a light Chicken Spring Roll with this wine – this recipe uses lots of ginger and garlic to produce a lighter style of spring roll which she thinks will complement the wine well. Her secret tip? Make them with phyllo and bake them in the oven to reduce fat and retain their crispy bite. Thailand isn’t an area which featured much in Debra’s discussions about wine sales – her speciality is the Hong Kong and Chinese markets. But many Thai restaurants here in SA and around the world are learning the value of a good Riesling as a food partner – and it doesn’t get much better than this 2009 Jordan Riesling. Off-dry and with lots of lively acidity, it still has plenty of softly aromatic fruit whilst the secondary flavours are just beginning to deliciously kick in. Off-dry wines and spicy food are a great combination so Caro has gone for a classic Thai Chicken Green Curry with this wine. She uses coconut and coconut cream to make a rich, velvety sauce for the meat and veggies but the acidity in the wine should cut through that with ease making for a refreshing dish. Neal Martin is a Brit and a Southerner by birth but his travels have taken him all over the world in search of great wines. The Hillcrest Quarry Merlot 2008 is a great example of a variety which doesn’t always have the best press in this country – we tend to either make it too green or too jammy. This one gets the balance between fruit, tannin and oak to perfection – a worthy winner. Can there be anything more English than Roast Beef and Yorkshire Pudding? Well actually, the UK’s national dish these days in terms of popularity is Chicken Tikka Masala, but a good old Sunday roast is still popular countrywide. Chef Caro has chosen this to partner the Merlot – the warm velvety wine will go perfectly with the rich meat and the filling puddings. All the overseas judges were particularly impressed with the quality of our Shirazes with comparisons to the best in France and Australia abounding. The Thelema Shiraz 2007 is an often underrated wine which benefits from the cooler climate of its high vineyards in the Banhoek valley. This results in a smooth wine with pronounced pepper and violets – a classic Shiraz in any country. If Shiraz is looking like the king of SA reds, then it should surely be matched with the English King of Cheeses! Caro has gone for a recipe of Glazed Stilton, the finest blue cheese in the world (according to the English anyway!). If you can’t find Stilton of the budget doesn’t stretch so far, try a good local version from Fairview or Simonsberg to pair with this majestic wine. Thierry Desseauve was paying his first visit to South Africa although I don’t think it will be his last. Surprisingly, it was SA’s Pinot Noirs which most impressed him with the stand-out wine being the Meerlust 2009. Carefully crafted from cool, South-facing vineyards, this has been one of the country’s top Pinots for many a year and thoroughly deserves this accolade. What else could Caro put with a top Pinot Noir than Burgundy’s signature dish? Boeuf Bourguignon is a classic French dish and whilst Caro’s budget probably won’t stretch to cooking with this wine, she thinks that it is going to be a match made in heaven as the rich, savoury meat meets the smooth, velvety wine. The Paul Cluver Chardonnay 2009 is a fitting end to an Old Mutual Trophy Wine Show Vin-atics as it is the most decorated wine this year! Winning not only best Chardonnay, it also garnered trophies for Best White Wine and the Judges Choice award too. 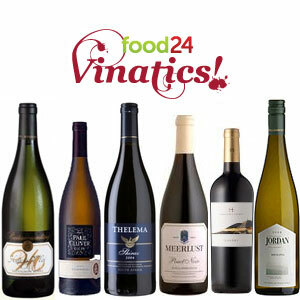 This is one of SA’s stand-out wines, if you get a chance to try it – take it with both hands!! Caro has gone for a slightly different dish here by pairing the Chardonnay with a classic French Tarte Tatin. Paul Cluver used to be an apple farm and there are definite hints of the fruit in the wine which, matched by the creamy oak should hopefully go well with the creamy, caramelized fruit of this dessert.